Great things come from pursuing your passion, a sentiment proud adopter and fundraiser for the Home Tam van der Kleij knows well. Since adopting Daria nine years ago, the pair have gone on to touch the lives of many shelter animals since. Combining her love for dogs and photography, every year Tam takes happy snaps of dogs who frequent her local park, producing a calendar that has raised thousands of dollars for the Home over the years. She has gone from selling 12 copies in the first year to over 100 copies in recent years, even inspiring a San Diego spin-off after a copy made its way to the US! So far the 2015 Travancore Dog Park Calendar sales surpassed Tam’s original target of $1000, raising an impressive $1600 for our shelter animals. Here is a message from Tam about her calendar’s recent success. Travancore Dog Park Calendar 2015 exceeds all expectations! 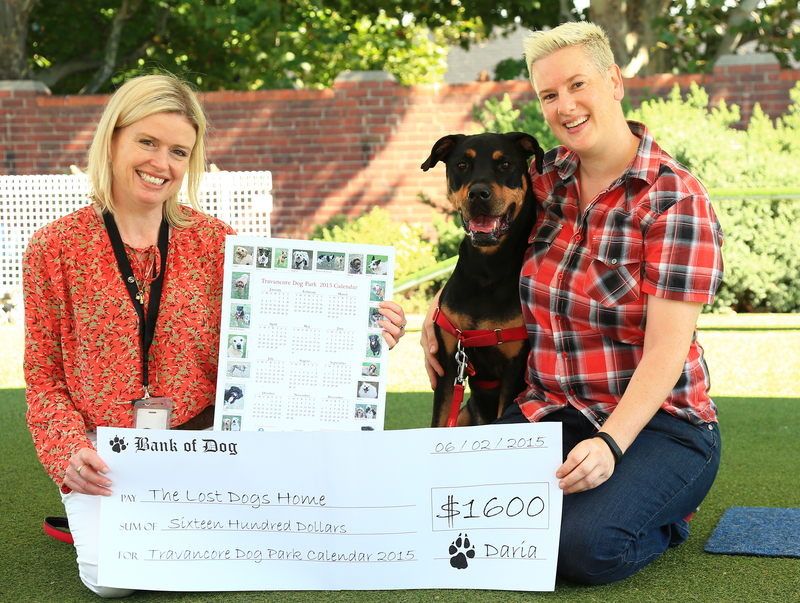 For the past seven years the Travancore Dog Park Calendar has grown in sales resulting in bigger and better donations for The Lost Dogs’ Home. This year, as we inched closer and closer to the $1000 mark I thought maybe, just maybe, this year we could finally achieve the grand target. And, it is with great pleasure and just a little bit of pride that I can finally announce that we blew that target away — Daria, the rescued Rottweiler who started it all, and I donated $1600 to The Lost Dogs’ Home! As much fun as it is to take the photos, design the calendar and see the smiles on both owner’s and dog’s faces when they behold the finished product, the most rewarding part is knowing that our donation assists in keeping the Home’s Animal Ambulance, responsible pet ownership education programs funded and supports important de-sexing and micro-chipping events. Daria and I would especially like to thank MJ Printing in Cremorne who provided us with a special ‘animal lovers’ discount; the Flemington Farmer’s Market and all their stall holders and customers who were so friendly and supportive; and lastly to EVERY person and dog who bought a calendar! A limited number of calendars are still available and can be purchased for $10 or three for $25 by contacting our fundraising team on (03) 9329 2755.